So I opted for Science in my senior school, but that was only because it was the only option offered at my school, and I wanted to remain at that school because I wanted to continue studying Computers from this particular teacher there! Weird reason, I know! Despite that, I managed to score well in Science, though I never really took a liking for any of the Science subjects. Organic chemistry was always a pain in the you-know-where. And surely, a girl who wouldn't use the microwave without her dad standing nearby couldn't be expected to care a zilch about how things worked! Right? And therefore, what happened during my pre shop-setup and early shop-setup days shouldn't come as a surprise to you. So what really happened during my pre shop-setup and early shop-setup days? You see the image above? That's the top half of the front of my shop. You can see the shutter pulled up just below the name of my shop. There's that handle below "ITA" of "KITAB". Ok so when I initially rented this place and had just started setting things up, this shutter was a source of great mystery for me. I couldn't figure out where it "went" when it was "pulled up". For weeks, I believed that there was some hidden opening in the ceiling, through which the shutter slid up, right through to the floor above. Like how sliding doors work, you know. And I kept straining my neck to find that "opening". In vain. Then, once the furniture and fixture was set in my shop, we went for stock purchasing. Even at the wholesale market, I found myself spending more time looking at the shutters of shops than at the goods displayed in shops. Hoping to catch a glimpse of that mysterious hidden slot where the shutter disappeared. And then I noticed something odd. A "double-decker" shop. There was an entire wall of glass display-case directly above the shop entrance. That invalidated my entire theory of there being a hidden cavity in the wall above the "sliding shutter", because if the shutter "slid up" to the floor above, the glass display would not have been visible! I returned with the stock, scratching my head, more confused than ever before. And then my shop opened business, and I was still no closer to solving this great mystery of the shop shutter. Guess who came to my rescue then? My favorite birds! 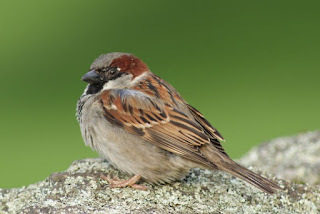 Yupp... these little house sparrows! These tiny, fluffy, cute little birdies who keep chirping incessantly! These small birds are regular inhabitants of the market where I have my shop. They come and go as they please. 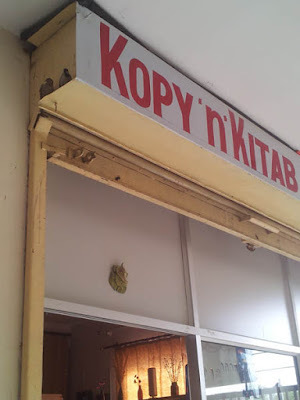 On any given day, you'll find at least three nests of these birds above my shop shutter. If you look carefully at the first image, you'll see a tiny gap (couple of inches) between the ceiling and that "box" on which my shop's name is painted. That's where all those nests are usually located. Some of these birds are more adventurous though, and they will make their nests *inside* that box. The first time they did that, I couldn't understand why their nest fell down every time Dad pulled the shutter. They collected twigs all through the day and built their nest, and at night, the whole thing came down with the shutter. Then they got back to work through the night, but in the morning, the whole bunch of twigs and dried leaves came tumbling down once again when Dad pulled the shutter up. This happened every morning and every night without fail. I used to stand directly below that "box" and watch those birds flurry past me with little twigs and grass and leaves, and disappear inside that box. And I used to crane my neck to see where exactly did they assemble those twigs, so that it all came down with the shutter. And then one day, I saw! That "box" wasn't just a space designed to paint your shop's name on and hang Diwali lights from. It was actually a cunningly devised "cover"! A cover for the shutter, which, when pulled up, rolled-up like a carpet, fitting smugly inside that "box"! And those silly little birds spent the entire day building their nest on that shutter-roll! Then they spent the entire night rebuilding it on the base of that empty shutter-case! They might as well have built their castles in the air! Oh but you can't imagine my ecstasy that day! It took me more than 3 months, but I FINALLY KNEW where the shutter went when it was pulled up! And boy, wasn't it absolutely brilliantly perfect? I mean can you make out from that first picture that there's a whole heavy-duty iron shutter neatly rolled-up inside that humble-looking "box"? And the shutter doesn't even get stuck or "tangled" in any way when being pulled up or down--the mechanism has been designed to work so well! I tell you, I was on seventh heaven that day. I was so happy that the mystery was finally solved. And I was so amazed at the sheer elegance of the system. Moments like these make you wish you had taken mechanical engineering instead of commerce in college! Thanks Kala! I normally don't stress over how things work... am happy as long as they continue to work. This was a rare occasion. Thanks Rekha! Yeah, I don't know how much longer I'd have puzzled over this if not for those birds. Ha ha ha! You're in top form, Kadzilla. @Abhiroop: Haven't I told you about this shutter story on phone ages ago? Like when my store was still new?